Cervical artificial discs can be installed to treat degenerative disc disease and intervertebral herniation in the neck anatomy. Artificial disc replacement has been available for decades now and has proven itself to be a viable alternative to the traditional treatment path of spinal fusion. Although not perfect, disc replacement surgery does demonstrate some distinct advantages when contrasted against spondylodesis procedures. We initially covered spinal disc replacement over 15 years ago, when it began to enjoy widespread application in the USA. However, pioneers in these technologies have been using synthetic disc substitutes to treat a range of back and neck pain conditions since before 1990. This fascinating essay delves into one of our favorite topics: artificial cervical spinal disc replacement. We will evaluate the risk and benefits of the procedure in comparison to spinal fusion and will also examine some of the current models of artificial cervical disc which are available for use as orthopedic implants. Available types of artificial cervical spinal discs are always changing, as new designs are created, new governmental approvals granted and old designs taken off market, revised or proven to be problematic. Once, there were only a few styles of cervical replacement disc options, often regulated by extremely constricting criteria for indicated use, at least in America. Now, there are more options than ever before and more possible indications for utilization globally. The BRYAN cervical artificial disc is one of the more complicated and engineered models, featuring a multi-piece design comprised of titanium and polyurethane. 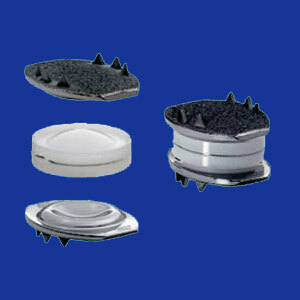 Mobi-C artificial cervical disc is a simple design of metal endplates with a flexible polyethylene core. PCM cervical disc is a similar style, with metal plates encompassing a polyethylene nucleus. ProDisc-C is another style of metal disc with a polyethylene core material for flexibility and shock reduction. SECURE-C artificial cervical disc is another metal design with a plastic core. Prestige LP cervical artificial spinal disc is a very simple titanium/ceramic mix without a separate core material. Surgical implantation of artificial spinal discs has improved light years in the past decade. Now, all implants can be placed using minimally invasive and sometimes anterior approach surgical techniques for minimal disruption of the surrounding muscular anatomy. Typically, only a small incision or two is necessary to access the spine and allow placement of the disc substitute into the intervertebral space, after the organic disc material has been completely removed using discectomy. Some artificial discs require fixation to the vertebrae above and below. This is usually accomplished using surgical screws. Other discs are simply inserted into the spine and are held in place by a combination of factors including natural design of the spine, engineering of the artificial disc shape and gravity, combined with weight of the body pressing downwards. We have witnessed a range of diverse placement techniques being used to position synthetic spinal discs in the neck. All of the procedures utilized impressed us with their simplicity, minimal blood loss and virtually immediate ability for the patient to ambulate rather easily and independently after surgery. Fusion negatively impacts the organic design and functionality of the spine. Results include increased stress and exponentially accelerated degeneration of spinal levels surrounding the fused sections of backbone. Disc replacement maintains natural spinal form and function, allowing independent movement of each vertebral level. Spinal fusion also has far-reaching consequences on posture, gait and lower body joint deterioration outside of the spine. Typically influenced structures include the sacroiliac joints, hip joints, knee joints and lower leg joints. Disc replacement spares the anatomy these stresses by allowing the patient to move in a manner which is comfortable and familiar to them and their spine. Hardware failure is possible, particularly in multi-piece disc designs. The actual prosthesis can break, but far more common is the slippage of these implants which may necessitate secondary surgical correction. Infection, implant rejection and other complications of the disc itself are some of the most commonly observed risks of spinal disc replacement operations. Even once the procedure is deemed a success, complications can still occur over time due to the development of organic tissue infiltration into moving parts of the disc, related deterioration of the fixation mechanism, scar tissue accumulation or other problematic occurrence, such as reduction or elimination in the disc’s ability to provide flexibility in the operated level.